Parked on the tarmac at Andrews Air Force Base, Md., are two Boeing-built aircraft symbolizing the United States of America�the C-32A (also known as Air Force Two) and the C-40B. With their trademark blue-and-white liveries, these Boeing-built Special Air Mission (SAM) aircraft belong to the U.S. Air Force's 89th Airlift Wing fleet. This unit is tasked with providing safe and reliable travel and logistical support to high-ranking U.S. government officials and dignitaries. These high-profile jets are specially configured military versions of Boeing commercial aircraft, complete with state-of-the-art avionics and onboard communications systems. Each functions as a fully equipped "office in the sky" to ensure top-ranking U.S. government officials and dignitaries can safely, efficiently and securely conduct classified government business in flight, anywhere worldwide. Boeing Frontiers recently got a behind-the-scenes tour of C-32A and the C-40B, with 89th Airlift crew members offering their insight on working aboard these world-famous Boeing jets. "Boeing jets have been getting people safely to destinations for years, and that's what we're all about," said Maj. Stuart Miller, C-40B pilot. "Doing it the right way, first time, every time-that's what SAM FOX is all about. These planes are a symbol of excellence." SAM FOX is an Airlift Wing term symbolizing its attitude of extraordinary professionalism and dedication to perfection. SAM crews are entrusted to provide impeccable service with razor-sharp precision for their passengers. 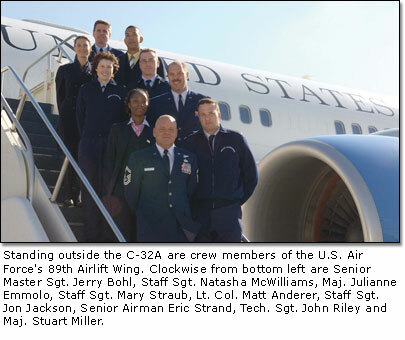 The 89th Airlift Wing is staffed with skilled military professionals in communications, operations, maintenance, mission support, medical services and safety. "Safety, comfort and reliability are the main crew goals," said Lt. Col. Matt Anderer, 1st Airlift Squadron Operations Officer and C-32A pilot. "We can't afford to have heads of state walk off the plane tired or jet-lagged." "We have a great responsibility," said Senior Master Sgt. Jerry Bohl, 1st Airlift Squadron Superintendent and C-32/C-40 flight attendant. "The pilots and crew are the best at what they do. It's very hard work, but our job is to make it appear seamless to the passengers, so they can do business for the United States of America." The C-32A is a specially configured military version of the Boeing 757-200. The primary customers are the U.S. vice president�when the aircraft uses the call sign "Air Force Two"�the U.S. secretary of state and secretary of defense, the first lady and members of Congress. Boeing was awarded the C-32 contract in August 1996, and the aircraft was deployed in June 1998. The C-32 replaced the Air Force's aging C-137 aircraft, a version of the Boeing 707. 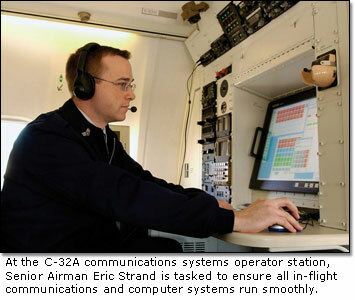 What makes the C-32A an "office in the sky" is its onboard communications system. The aircraft has its own computer Local Area Network, so the aircraft can travel internationally without business interruption. The C-32 is equipped with secure worldwide-capable voice and data systems, including telephones, satellites, and fax and copy machines. It's also equipped with Connexion by Boeing and high-speed Inmarsat broadband data and video-teleconferencing capabilities. For the pilots flying Air Force Two, the nuances between a standard 757 commercial aircraft and the modified military version are subtle, yet extraordinary. The flight deck is the same as a standard 757-200, but with radio and navigation systems enhancements. "The aircraft is a pilot's dream. There are newer technologies in the cockpit, which make flying easier and safer. 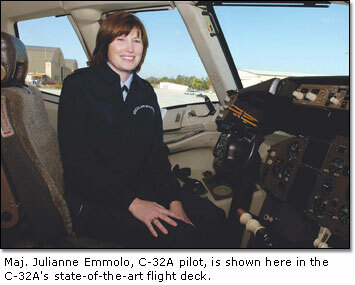 We love it," said Maj. Julianne Emmolo, C-32A pilot, who's served on the C-32 for two years and served in the Air Force for more than 12 years. The flight deck's state-of-the-art avionics include the Traffic Alert and Collision Avoidance System II and Enhanced Ground Proximity Warning System, which give advance warning of possible air and terrain threats. Weather systems are enhanced with a Predictive Windshear Warning System. Other avionics include the Global Positioning System for precision navigation and a Flight Management System. Flight, navigation and system status information appears on the flight deck's Electronic Flight Instrument System. But state-of-the-art avionics are just one of the rewards of flying the aircraft. "Being a part of a mission and part of historic moments, like tsunami relief and treaties�I'm helping get the people there to get their jobs done. It's a very good feeling," Emmolo said. The C-32's fuselage is identical to the 757-200, but stepping aboard the aircraft, the specially designed interior and furnishings underscore its purpose to conduct business while providing comfort during extended flights. The passenger cabin is divided into four main sections: the forward galley, the conference/staff area, distinguished visitor stateroom, and the general seating area. Walking down the aisle from the flight deck toward the forward galley-past closets and the standard 757 lavatory-there are 10 business-class seats for crew seating. There's also the communications systems operator station, where the communications system operator manages the complex onboard communications network. Just past the forward galley is the conference/staff area, with eight business-class seats and two worktables, with four seats at each-an area recognizable from historic photographs or news videos that show dignitaries working aboard. Off the conference/staff area is a door leading to the distinguished visitor stateroom, a fully enclosed room for the government leader's use and privacy. It includes a changing area, a standard 757 lavatory and a convertible divan that seats three and folds out to a bed. There are two first-class swivel seats at a worktable; decorating the wall above the seats is the presidential seal. Continuing past the stateroom is the general seating area. It has 32 business-class seats arranged in typical commercial airline rows. The front portion is reserved for Secret Service personnel and is separated by a partition. After that is seating for invited guests or media, then more closets and lavatories along with an aft galley. The C-40B is a military version of the 737-based Boeing Business Jet. It serves senior military and government leaders, as well as members of Congress. The BBJ combines the 737-700 fuselage with the wings and landing gear from the larger and heavier 737-800. The aircraft has five auxiliary fuel tanks. The 89th Airlift Wing acquired its first C-40B aircraft in December 2002. The 15th Airlift Wing, Hickam Air Force Base, Hawaii, acquired its C-40B for U.S. Pacific Command in February 2003. The 86th Airlift Wing at Ramstein Air Base, Germany, acquired its C-40B for U.S. European Command in September 2005. Similar to Air Force Two, the C-40B is equipped with 21st century avionics equipment, including an integrated Global Positioning System, Flight Management System, Electronic Flight Instrument System and a "head up" display that places critical flight information on a transparent glass screen between the pilot's eyes and windscreen. Safety enhancements include the Traffic Alert and Collision Avoidance System, Enhanced Ground Proximity Warning System and Predictive Wind Shear System. 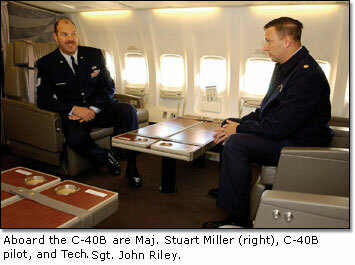 "There are important safety-awareness avionics in the C-32 and the C-40," said Maj. Stuart Miller, C-40B pilot, who's served in the USAF for 19 years and as a C-40 pilot for five years. "These are well-built and even safer airplanes than ever before." As with the C-32A, sophisticated onboard communications equipment allows military and government leaders to conduct business smoothly in flight anywhere in the world using Internet and LAN connections, secure telephones, satellite links, and fax and copy machines. The interior configuration slightly varies from the C-32. Walking from the cockpit, there is a crew rest area with four business-class seats and a BBJ lavatory, followed by the communication systems station. Behind that is a general seating area with 14 business-class seats followed by a conference/staff area, with eight business-class seats and worktables. Walk farther and you'll find the distinguished visitor stateroom, with sleep accommodations, two business-class seats and a worktable. With high-profile passengers aboard some of the most visible aircraft, it's not so much the commercial-airplane skills that are top of the pilot's job requirements, but their military experience. Flight attendants aboard the dignitary fleet are responsible for myriad duties, including attending to their passengers' safety and comfort. That latter aspect even includes planning of and preparation of meals. Indeed, in addition to being versed in emergency procedures and customs regulations, the flight attendants are skilled chefs. There is no catering aboard the fleet. In advance of missions, flight attendants prepare the menus and shop for all food themselves. Culinary school is part of the training, said Staff Sgt. Jon Jackson, C-32/40 flight attendant, who never cooked before but now can whip up an impressive meal. "When hiring to fly the C-32 or C-40B, it's more about the mission and less about flying an airplane," said Anderer, the 1st Airlift Squadron Operations Officer. "It's more about the pilot being flexible to changes and to handle other stressors with dignitaries aboard, such as last-minute change of flight plan." The natural reflexes from military flying experience should be second nature in flying the plane, he explained, so the pilot can concentrate on performing the mission. 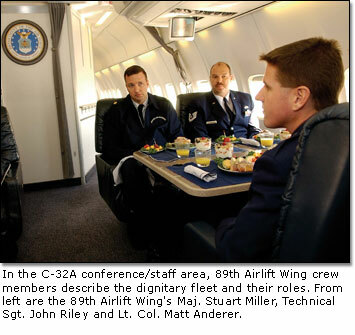 For the C-32, three pilots typically fly the aircraft�two flying and one in the jump seat. Anderer said they often fly with a fourth pilot to expose new recruits to mission requirements. Pilots can fly up to 56 hours in seven days, 125 hours in 30 days, and 330 hours in 90 days. "Safety, comfort and reliability are our top goals," Anderer stressed. As a flying crew chief for the C-32A and C-40B, Tech. Sgt. John Riley is responsible for knowing all the onboard technical systems and their maintenance, including communication networks and avionics. Crew members, Riley said, attend regular hands-on maintenance training classes through Boeing. "The crew feels a self-pride about their work, and they come aboard feeling good supporting the leaders," Riley said. Said Bohl: "It's an honor for everyone to work for the 89th Airlift Wing. It's a lot of hard work, but it's fun."